We feel it is important to try and maintain the same hand techniques and methods originally used by Dard Hunter in our reproductions and recreations of his work. For this reason, we operate a hand papermill at our Mountain House Studio for making much of the paper used in printing his original art. 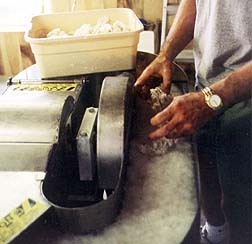 We begin the process by beating all-cotton rag and fiber, using a Hollander beater, into a fine, smooth pulp. This beating process takes many hours and results in a smooth, even fiber in the pulp. The paper produced in this way is acid-free and archival, and unlike wood pulp paper production, the process is non-polluting. When the pulp is sufficiently beaten, it is mixed with clear water and poured into a large vat. 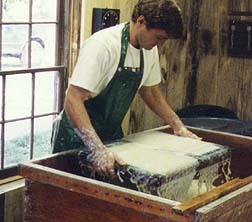 This slurry of pulp and water must be gently stirred before each sheet is formed to insure that the pulp does not settle to the botton of the vat. The paper sheets will be formed on a mould, consisting of a fine brass screen held in a wooden frame. A cover, open in the center like a picture frame, is placed over the mould. This cover is called the deckle, and will determine the size and shape of the paper sheet formed on the screen of the mould. 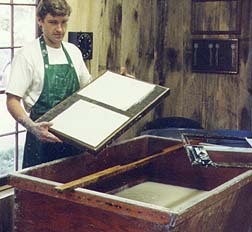 The mould and deckle are held together and plunged into the vat of pulp and quickly lifted out. You can see in the photo that the papermaker must expertly shake off excess water and pulp as the fibers settle onto the mould in order to ensure uniform and even deposit of the pulp. Shaking the mould forward and back and side to side causes the pulp fibers to crisscross, resulting in a strong, durable paper. The ability to produce consistent sheets of even thickness is a skill that takes years to develop. After a few moments the excess water has drained through, leaving a layer of pulp on the screen. The deckle is carefully lifted off revealing sheets of formed paper on the mould. The wet pulp, now in the form of a sheet of paper, is removed from the mould in a process called “couching” (pronounced ‘coo-ching’). The freshly formed sheet has the consistency of marshmallow foam, so great care must be taken at this stage. The mould is positioned at the edge of a large sheet of thick felt. Then, in one smooth, rolling motion, the mould is pressed down firmly and then gently lifted off the felts. If done properly, the finished sheet of paper will be transferred to the surface of the felt. Another piece of felt is then placed on top of the first piece, and the process is repeated until a stack or “post” of layered sheets is created. 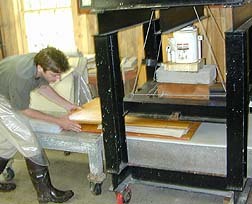 The post of interleaved sheets of paper and felt is placed between heavy boards and transferred to the press. Here all of the excess water will be squeezed out of the sheets in preparation for drying. It is important to press as much water as possible out of the sheets. 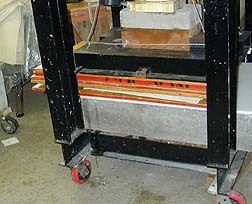 We have constructed our press from welded steel beams and hydraulic jacks, capable of exerting thousands of pounds of pressure on the post of paper. The post is positioned and the press is lowered. Depending on the kind of paper desired, the paper may be removed, placed between dry felts and pressed again.